I never quite understood the cult appeal that Veronica Mars seems to have, 'cause on the surface it just looked like another pretty girl show, so maybe I should check the show out on Netflix to see. I *definitely* appreciate its fandom, though -- I love it when fans are so passionate about something that their letter writing and protests get stuff accomplished. Give it a try! The show was dark and funny and the relationships were so interesting. 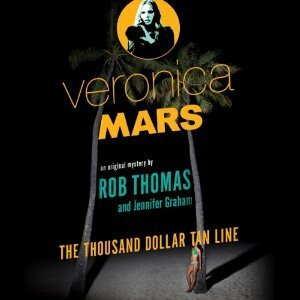 I've never heard of Veronica Mars, so maybe I've got my head in the sand. :) But, I seriously need to try a few murder/mystery type books. I haven't read one in years. The show was on several years ago and a movie just came out this summer. I have to say that I'm curious if anyone is reading this one who wasn't a fan of the show. I enjoyed it but I was already invested in the characters. I've certainly heard of Veronica Mars and the actress Kristen Bell but I think this show came after my kids were the target audience, though I am not putting down adults who love it :) Glad you enjoyed the book! It was on during my last years of high school/first year of college. Those are the kind of things that stick with you, I think! I loved the Veronica Mars series! And I really want to read this book. I just haven't been able to find a copy yet. It's at the top of my list but.... Listening to Kristen Bell read the audio version would be fun. I'm just not an audio-book person. I read so much faster than someone can speak I get impatient whenever I try to listen to a book. I can understand that. I don't listen to a lot of audiobooks, but I felt like this one would be worth it! I was skeptical at first when a female colleague, whose taste in movies and literature often clashes with mine, recommended this show and told me it was about some teenage girl who solves crimes. The premise did not appeal to me at all. I kept telling her that I wouldn't like it but she continued to bug me incessantly about it. She even went so far as to lend me season 1. I finally broke down and decided to watch it one day to get her off my back and was hooked instantly. Consider me an avid fan of this series. Season 1 and 2 are fantastic and I like to pretend that season 3 doesn't exist. The movie was great though. I'm glad your colleague broke you down! It's such a fantastic series and I was so happy to hear from these beloved characters again. Give it a try! It is one of my favorite shows of all time.